The recent history of American men in Paris has been somewhat unkind, John McEnroe’s meltdown to Ivan Lendl, up two sets and a break in the 1984 final, and the gritty victory of Michael Chang over Stefan Edberg in 1987 marked the first time an American had won since Tony Trabert in 1955. Andre Agassi’s losses to first Andres Gomez, and the following year to Jim Courier were surprising, since he was the favorite. Courier went on to win again, but the drought continued until Agassi completed his career Grand Slam against Andrei Medvedev. Today’s draw for the 2005 French Open provides Andy Roddick and Agassi with a less than treacherous paths to the second week. A year ago, no US player reached the round of 16 with Agassi being upset in the opening round by Jerome Haehnel and Roddick going out to Olivier Mutis in five sets in round two. But this year, the leading Americans should have little trouble until a possible quarterfinal encounter with each other. Roddick begins his tournament against French wild card Jo-Wilfried Tsonga. He could be pushed by Jose Acasuso next, but should move on to potentially face his good friend, Canadian/Brit Greg Rusedski. The two have traded barbs through the media in the past while Roddick has dominated on the court, winning their last five meetings, including earlier this year in Rome. After Rusedski, though, Roddick’s path gets a bit more trying. Hard-serving Croat Ivan Ljubicic almost single-handedly upset the US in Davis Cup play earlier this year, beating Roddick 6-2 in the fifth set. 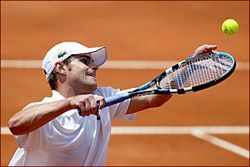 Then could come Agassi and last year’s runner-up Guillermo Coria in the semifinals, but Roddick should be able to improve upon his career best finish at Roland Garros. As for the ageless Agassi, a date with Arnaud Clement looms in the third round, which will not be easy in any regard with the Parisian crowd strongly behind the Frenchman. The fourth round could see Agassi face the indefatigable Argentinian Guillermo Canas. But like Roddick, Agassi could manage to avoid the real clay court wizards until deep into the second week. On the ladies’ side, top-seeded Lindsay Davenport faces Katarina Srebotnik in the opening round and should cruise into the fourth round. However, there possibly awaits Kim Clijsters. The former world #1 has recovered from the wrist injury that robbed her of most of 2004, but is now hampered by a knee injury, which almost forced her to withdraw from this event. Assuming Clijsters is strong enough to reach the round of 16 and take on Davenport, she will be after her seventh consecutive defeat of the reigning world’s number one player. A quarterfinal appearance could earn Davenport a match with the red-hot Patty Schnyder, ninth-seeded Vera Zvonereva, or 2000 French Open champion Mary Pierce. Last year’s finalists, the Russians, Elena Dementieva and Anastasia Myskina, or Venus Williams are all possible semifinal opponents for Davenport. The dangerous Maria Sharapova, the Wimbledon champion also lurks in the draw. Venus is the lone Williams in the draw after Serena withdrew Friday because of her aching ankle. Serena is the only African-American to win all four Grand Slams, a feat that eluded the great Althea Gibson and Arthur Ashe. Yannick Noah, the Cameroon-born Frenchman is the only man of African descent to win it, beating Mats Wilander in the final. Noah, ironically, was discovered playing on an overgrown tennis court in Africa… by Arthur Ashe. Venus played well this week, winning in Istanbul, and shouldn’t struggle too much to advance to the quarters, where Myskina could be waiting. The smart money is on Roger Federer of course, and the Belgian women, Justine Henin-Hardenne and Clijsters. Federer has been virtually unstoppable, and the French is the only Grand Slam title he does not possess. I was about ten years old when Arthur Ashe came to Carter Barron, my neighborhood tennis court in Washington, D.C. to give a clinic. I showed no promise, but my love of the game has kept me following tennis for over thirty years. The French is the only Grand Slam played on clay, and is always one of the most fascinating to watch, and the most difficult to predict. The Americans are going to need every bit of luck to win it… and so will every one else.